Our next Book Club event will be on Saturday 1 October from 6-8pm at Octavo’s Bookshop in West Bute Street, CF10 5LJ. 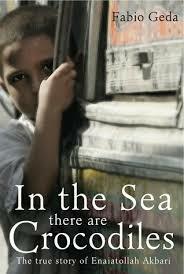 Celebrated writer Fabio Geda will be joining us from Italy to discuss his acclaimed book In the Sea there are Crocodiles. This event is in English and Italian. Tickets are £3 for members and £5 non members (includes discount on signed copy). In early 2002, Enaiatollah Akbari’s village fell prey to the Taliban. His mother, fearing for his life, led him across the border. So began Enaiat’s remarkable five-year ordeal—trekking across bitterly cold mountains, riding the suffocating false bottom of a truck, steering an inflatable raft in violent waters—through Iran, Turkey, Pakistan, and Greece, before he eventually sought political asylum in Italy, all before he turned fifteen years old. In the Sea There Are Crocodiles Fabio Geda delivers the moving true story of Enaiat’s extraordinary will to survive and of the accidental brotherhood he found with the boys he met along the way. Geda brilliantly captures Enaiat’s engaging voice and humor, in what is a truly epic story of hope and survival, for readers of all ages. Fabio Geda is an Italian writer who formerly worked with children in difficulties. He writes for several Italian magazines and newspapers, and teaches creative writing in the most famous Italian school of storytelling, the Scuola Holden in Turin. Since the international success of his best selling novel In the Sea There Are Crocodiles, Fabio devotes most of his time to writing and attending literary festivals around the world. In the Sea There Are Crocodiles is his first book to be translated into English and won the 2013 Marsh Award for Children’s Literature in Translation. We are pleased to announce that the ICCW Language Maintenance Courses will resume on Saturday 24 September. Our first lesson will be held at Cardiff Central Library from 10 to 11 am to celebrate European Day of Languages with our friends of Europe direct. Our second lesson will be at Chapter Arts Centre on Saturday 1 October from 10-11 am and author Fabio Geda will be joining us and reading from his amazing book In the Sea there are Crocodiles.